We started the evening with a presentation to Mike Lawson for his image of a Puffin in flight, which was the peoples choice at our Annual Exhibition at the Liverpool Anglican Cathedral. Playing to a packed house… The Society’s New Competition Season got under way tonight (25.09.14), the heading for the competition entries submitted, was ‘Humour’. 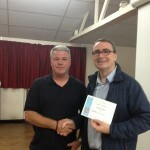 Our visiting independent Competition Judge for the evening was Mr. Terry Donnelly. Terry’s comments along with his marking regime were ‘exceptional’ and many of the SLPS members commented on this fact, both during and after the evening (in the bar). The entries from the Society members were good and many of them caused quite a lot of amusements (some more than others) and this made the evening a fun and memorable one. it showed the quality of the images shown, that our Judge for the evening gave at least 17 as a minimum (out of a maximum 20) mark to all the images submitted. Terry, finally came to his decisions on the winners of the best Colour print, Monochrome print, and Digitally Projected Image (DPI), and he settled on Tom K’s great colour image… titled “who ate all the pies. Next up was Bert W’s wonderful B&W capture… “It’s got to be here somewhere” and finally, Ian K’s DPI… “Another sucker caught. Better call the Doctor – Doctor Who”. However, Bill Mc, our Competition Secretary, did ask the members to keep their titles short to fit them on the showings (personally I read shorter novels than Ian’s winning title…lol). The evening came came to a climax, with Terry choosing an overall winning image amongst the three section winners and this was………. Ian K’s DPI with the ENORMOUS title….. lol. 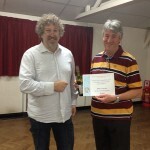 Terry runs a number of courses and photo-shoots, which can be found on his website along with a selection of his images @……..
Mike Lawson receiving his SLPS Exhibition 2014 Peoples Choice Award certificate. 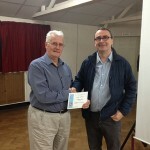 Tom Kipping receiving his Best Colour Print certificate. 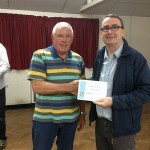 Bert Whittlestone receiving his Best Mono Print certificate.